SIP Vs Lumpsum Mutual Fund Investment: Difference & Which is better? 10.47% Muthoottu Mini Financiers NCD Mar 2019, Credit ratings, Reasons to invest, How to App & Why not to invest? Non-Convertible debentures are the long term financial instruments which acknowledge a debt obligation toward the issuer. Such NCD is a tool that is used by the companies to raise long term capital. Apart from this, NCDs offer various other advantages to the owner such as high liquidity through the stock market listing, tax exemptions at source and safety since they can be issued by companies which have a good credit rating as specified in the norms laid down by RBI for the issue of NCDs. The Muthoottu mini financiers incorporated in the year 1998 is all set for subscription on 18th March 2019. It is issuing NCD secured now. The yield is as high as 10.47% per annum which is indeed lucrative tempting the investors to pool their money. It is offering NCDs of 480 days, 36 months and 60 months. If we look upon the current scenario of fixed deposit or other investment option the returns they are providing are not that promising. The prime question that comes in mind should you invest in such Muthoottu mini financiers NCD of March 2019? What are the hidden factors an investor should consider before Investing Money in India? So, through this provide I would provide you with interesting insights about Muthoottu finance. The market swings wildly from day to day, it is important to not to caught up in the madness and stay rational. If you are someone with the high-risk appetite then you can consider investing in NCD. What is the Issue break-up? How to Apply for Muthoottu Mini Financiers NCD? 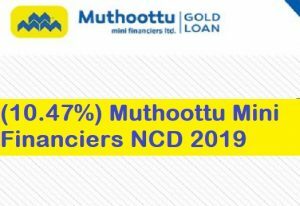 Should you invest in Muthoottu Mini Financiers NCD 2019? They are non-deposit deposit-taking systematically important BFC in the gold loan sector lending money against the pledge of household gold jewelry in the state of Kerala, Tamil Nadu, Karnataka, Andhra Pradesh, Telangana, Haryana, Maharashtra, Delhi and Goa and the union territory of Puducherry. The company has recently embarked microfinance lending wherein it provides an unsecured loan to the joint liability group of the women investor. Their Gold Loan portfolio as on September 30, 2018, March 31, 2018, March 31, 2017, and March 31, 2016, comprises of 96.35%, 95.31%, 99.01% and 99.60% of their total loans and advances as on such specific dates. They, as on September 30, 2018, have a network of 767 branches spread in the states of Kerala, Tamil Nadu, Karnataka, Andhra Pradesh, Telangana, Haryana, Maharashtra, Delhi and Goa and the union territory of Puducherry and they employ 2,905 persons in their business operations. The company is issuing secured Non-convertible debentures to the tune of 100 crores over subscription totaling 200. It comes with 6 different option which includes 480 days, 36 months and 60 months tenure NCD. They are offering secured NCD’S Now in March 2019. The NCDs would constitute secured and senior obligations of the company and shall be first ranking pari passu with the existing secured creditors on all loans and advances/ book debts/ receivables, both present and future of Company equal to the value one time of the debentures outstanding plus interest accrued thereon, and subject to any obligations under applicable statutory and/or regulatory requirements. NCD’s are available in 6 different options. The interest of these NCDs is payable monthly and on maturity. The face value of the NCD bond is Rs 1,000. The minimum investment is for 10 bonds means, you need to invest for a minimum of Rs 10,000. Beyond this, you can invest in multiples of 1 bond. These NCD bonds would be listed on BSE. Hence, these are liquid investments. Non-resident Indians (NRI’s) cannot invest in these NCD’s. IND Ratings has rated these NCDs as IND BBB-/Stable which indicate that instruments with this rating are considered to have a moderate degree of safety regarding timely servicing of financial obligations. Such instruments carry moderate credit risk. Vivro Financial Services and Vista ITCL India are the lead managers for this issue. How is the company doing in terms of the financials? Its profits are at Rs 9.77 Crores in FY2016 to Rs 14.2 Crores in FY2018. Its revenues for 6 months ended Sep-2018 was Rs 11 Crores. Gross NPA is at 2% for 6 months ended Sep-2018. Net NPA is at Rs 1.3% for a similar period. The company is issuing nonconvertible debentures which are safe to invest compared to the unsecured NCD. Why not to invest in Muthoottu Mini Financiers Mar 2019 NCD? Low credit rating from IND Ratings of IND BBB-/Stable. They are in receipt of a show cause notice issued by the RBI. Any severe action taken against the company or penalty imposed on a company by the RBI could resentfully affect their business and operations. The company does not own the trademark and they have been authorized to be used by one of their group companies. Volatility in the market price of gold may negatively impact the financial condition, cash flows and result of the operation. You can apply these NCD in demat form only. If you have a demat account, log in to your demat account go to IPO/NFO/NCD section and apply for the same. The procedure for applying NCD would be via ABSA (Your amount would be blocked initially and upon allotment, your amount would be deducted and NCD allotment would be done, else your amount would be unblocked) You can reach out to any of the lead managers websites to know more details on how to apply them. How Muthoottu Mini Financiers Mar 2019 NCD are taxed? Since you need to apply it through the demat account only, there would not be any interest on the nonconvertible debentures. Means it would get listed approx. On 25th April 2019 assuming that it would continue till 16th April 2019 i.e. the last date of subscription. If it is subscribed prior and subscription closes, it would get listed after 6 days from such closure. Though Muthoothu financiers are offering secured NCD, we are seeing that NBFC company is delaying an interest payment due to the liquidity of crunch in the company. Recently example was DHFL. Do you want to invest in such NCD’s then? there is high risk associated the company is giving 10.47% interest per annum. Muthootu mini financiers NCD proffer higher interest rates. Secured non-convertible debentures are considered somewhat better as compared to the unsecured non-convertible debentures. you can consider investing in Secured NCDs for 480 days or 36 months tenure NCDs. However, you should be willing to take the risks indicated above. Do you feel these NCD are worth investing? If you had a great time reading the above please share it with friends via facebook, twitter etc. Also, if have any queries or doubts pertaining to the post please write to us. you can approach us through the comment section given below. How to Invest in Share Market? Difference Direct Vs Regular Plan Mutual Fund Investment- Which one is better? Investor Academy is your financial guide website. We provide you with the latest news and videos straight from the finance industry. Tax Saving Mutual Funds (ELSS) Advantages & How to Invest?